My colleague, Peter Cohen, nicely details the ins and outs of movie rentals via iTunes. But when Peter wrote that piece, the Apple TV “Take Two” software update was still on the horizon. Now that this update has seen the light of day, it’s time to examine how rentals work on the Apple TV. To get there from here, choose Movies from the left side of the Apple TV’s split-pane interface and from the right side of the pane, select Top Movies, Genres, All HD, or Search. When you choose Top movies, you’ll see a screen full of movie posters. Featured movies appear across the top of the screen. Top rentals appear in the next row. Just added movies are below that. Staff Favorites come next. And finally, a collection of movie titles associated with a particular theme appear at the bottom. Today, for example, this row contains Oscar-winning movies. Choose Genres and you can look at movies by genre—Thriller, Comedy, or Drama, for example—and, in the case of G- and PG-rated movies, by MPAA rating. All HD presents a page of just those movies offered in high-definition (720p). 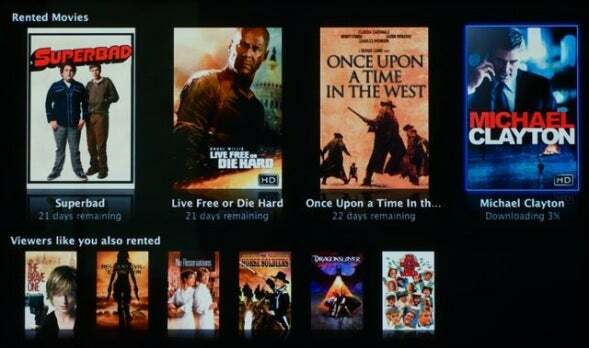 Apple claims that 100 HD movies will be available from the iTunes Store by the end of February. And Search produces a TiVo-like Search screen where you use the Apple Remote to enter characters to search iTunes’ library of movies. Search turns up not only movie titles, but also actors and directors. To watch a preview of a movie—and possibly rent it—just select a movie in one of these views and press the remote’s Play/Pause button. In the information screen that appears you’ll see a description of the movie, details on its cast and crew, a Preview button, and at least one Rent button. To preview the movie, you select the Preview button and press the remote’s Play/Pause button. The preview will stream to your Apple TV and begin playing when the Apple TV believes it can play uninterrupted. In regard to “at least one Rent button,” the information screen will show you all rental options available to your Apple TV. If the movie is available only in standard-definition you’ll see just that option along with the movie’s rental price. Standard-def library (meaning “old”) titles are priced at $2.99. Current movies in standard-def cost $3.99. If the movie is also available in high-definition, that option will appear as well. HD movies cost $3.99 for library titles and $4.99 for current titles. Apple has just implemented a new Movie of the Week feature where the Store offers one film, from Thursday to Monday, for just 99 cents. The movie will begin downloading to the Apple TV. As it does, you can visit the Apple TV’s Downloads screen (found by choosing Settings on the left side of the split-pane interface and then selecting Downloads) to view the download’s progress. A progress bar appears along with the percentage of movie downloaded. If you choose Rental Movies you’ll also find a percentage-downloaded figure there. When the Apple TV believes it’s downloaded enough of the movie so that it can begin playing it without interruption, a window appears alerting you to that fact. Should you choose the option to begin playing the movie, the movie begins and the 24-hour playtime clock starts ticking. You now have 24 hours to finish watching the movie before it’s automatically deleted from the Apple TV. The speed of your broadband connection determines how quickly you can start watching your rental movie. Apple claims that with a 6Mbps broadband connection, you should be able to begin watching a standard-def movie in less than 30 seconds and a high-def movie in less than a minute. A 2Mbps connection gets you playback for a standard-def movie in about a minute and a start time for a high-def movie in about two hours. If you have a 768kbps broadband connection you’ll want to plan ahead. Apple suggests a standard-def movie will be ready to play in 1.5 hours and a high-def movie in about eight hours. I have a broadband connection that manages between 3 and 4Mbps and my Apple TV has notified me that it’s ready to play an HD title in between 12 and 20 minutes—the Downloads screen told me that approximately 12-percent of the movie had downloaded. However, when I attempted to play Live Free or Die Hard immediately after that notice appeared I encountered rebuffering errors—where the Apple TV has to stop playback to load more data. This was on the first day rentals were available from the iTunes Store and the Store was likely being taxed heavily. 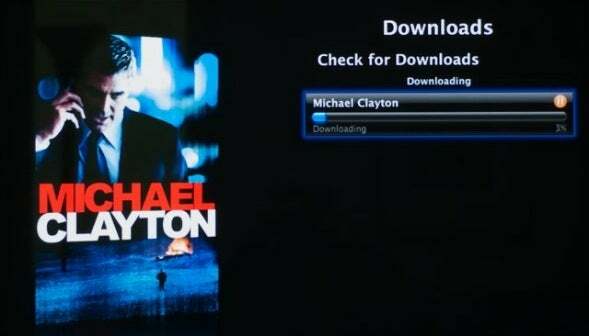 I tried the same test with the recently released Michael Clayton in HD and while I got farther into the movie—an hour and eight minutes—the movie eventually paused to load more data. To help speed your download and prevent such errors, it’s a good idea to avoid clogging your network with other downloads—grabbing the latest Mac OS update via Software Update, for example. If you want to view your HD movie without interruption it’s not a bad idea to give the Apple TV some extra time to download more of the movie, even if it tells you that it’s ready to play. In regard to downloads, the speed of your broadband connection is paramount. Wireless 802.11g and n (and wired Ethernet) are faster than anything your broadband connection can deliver. They’ll all be able to keep up and then some with data as it’s brought into your home. Although 802.11b wireless networking is supported by the Apple TV, it’s not a good option as it’s too slow to stream video, not to mention that syncing data from a large iTunes library to the Apple TV over this kind of slow connection would take something just under forever. When you initiate the download of a rented movie a Rented Movies entry appears in the right-pane of the Apple TV’s interface when you select Movies on the left side of the interface. Select Rented Movies and you’re taken to a screen that displays movie posters of all the rentals on the Apple TV along with the amount of time remaining before they expire—either days left if you haven’t yet started watching a movie or hours left if you have. Just as with rentals from the iTunes Store, you have 30 days to begin watching your movie before it expires and disappears from the Apple TV’s hard drive. Again, when you begin watching you have 24 hours to complete your viewing before the movie disappears. As I mentioned in a previous Playlist blog, you can kinda/sorta work around this by pausing a movie in progress, doing nothing else with your Apple TV, and then unpausing it when you’re ready to finish viewing it. You can do this even after the 24-hour limit has passed. But it’s a kludgy workaround given that you’ll likely want to do other things with your Apple TV. HD movies are delivered in 720p format (meaning 1280 by 720 pixels at 24 fps) and some, though not all, offer 5.1 Dolby Digital Surround Sound soundtracks. While the Apple TV allows you to upscale output to 1080p, it doesn’t deliver native 1080p content. Movies you rent on the Apple TV stay on the Apple TV. You can’t transfer them to your computer, iPod, or iPhone. Also, Apple TVs don’t talk to one another. If you have two Apple TVs in your house, there’s no way to transfer a movie you’ve rented on one to the other. You can, however, transfer movies you rent from the iTunes Store with your computer to the Apple TV. 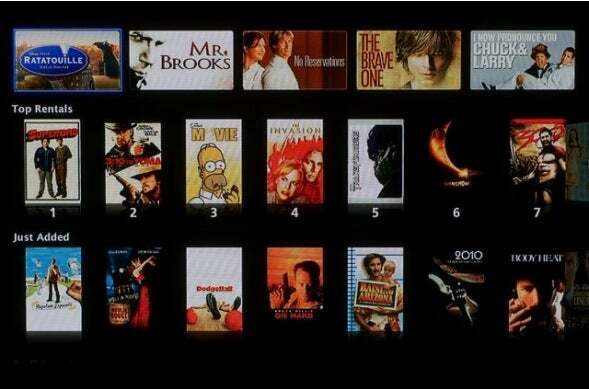 To do so, you select your Apple TV in iTunes' Source list and click on the Movies tab. If you’ve rented any movies with that computer and you haven’t moved them to another device—an iPod or iPhone, for example—you’ll see your rental listed in the Rented Movies area at the top of the window. To move the movie to the Apple TV, select the movie you want to transfer and click the Move button. The movie will be transferred over your network and appear in the Apple TV’s list of rented movies and be ready to play when it’s completely copied. Once on the Apple TV you can delete the movie from within iTunes or move it back to your computer so that you can watch it on the computer or transfer it to a current-model, screen-bearing iPod or iPhone.